UC Irvine, along with other community partners, is collaborating on the upcoming 2016 Joint Veteran Talent Reintegration Conferences to help the courageous and talented men and women who have served in all branches of the armed forces transition successfully into civilian industry jobs. Whether your company is interested in tapping into the specialized leadership, teamwork, discipline and/or strategic thinking skills and dedication veterans are known for, you want to learn more about employer rewards for hiring veterans, or you simply want to do your part to show veterans how much you appreciate their service and sacrifices for our Country, this event is for you. July 18, 2016, will be the first of three strategic programs focused on helping Veterans find employment. The first event — Veteran Talent Recruitment and Retention Bootcamp for HR Professionals — is not just for HR professionals, but also business and organization managers to improve their veteran recruitment and retention programs, de-mystify stigmas, understand veteran health issues including establishing a realistic perspective on PTSD, learn relevant laws, employer rewards, and overcoming challenges to retention. You will hear best practices directly from companies successfully utilizing Veteran talent and discover helpful community resources available to veterans and employers. Participating experts include Thomas Parham, Vice Chancellor Office of the Vice Chancellor Student Affairs; Michael Hollifield MD, Associate Clinical Professor, Director, Program for Traumatic Stress, Long Beach VA Healthcare System; Eli Pascal, UCI Assistant Director, CARE Campus Assault Resources in Education; John Tyler, US Army Sergeant (Ret), Employment Coordinator, Long Beach VA Healthcare System; Grace Tonner, Professor, Lawyering Skills, University of California, Irvine School of Law; Mario Barnes, US Navy Commander (Ret), Professor, Co-Director UCI Center on Law, Equity and Race; Antoinette Balta Esq., California State Military Reserve, Captain, JAG, Installation Support Command, President, Veterans Legal Institute; Veteran Law Clinic Lecturer, UCI School of Law; Jan Serrantino, PhD, Director, UCI Disability Services Center; Adam Karr, Partner, O’Melveny & Myers; Aaron Anderson, US Army Special Forces Green Beret (Ret), Associate, Trade Compliance, PIMCO; Stephanie Soltis, US Air Force Reserve Pilot, Vice President, Account Management, PIMCO; Jeff Matsen, US Army Officer, Vice President, Enterprise Risk Management, Edwards Life Sciences; Tim White, US Marine Corps Captain (Ret), Executive Vice President, Account Manager, PIMCO; Chip Hawkins, US Navy Senior Chief Petty Officer (Ret), Senior Military Recruiting Strategist, Veteran Outreach Specialist, Aetna; and Mark Whalls, US Navy Master Chief Petty Officer (Ret), Head of Military and Veteran Recruiting, HR Talent Acquisition Professional Recruiting, Aetna. Follow this link for more detailed information. UCI Veteran Services provides veterans, reservists, active-duty members and dependents assistance in obtaining the educational benefits to which they are entitled. The office is responsible for submitting entitlement requests for new and continuing students to the V.A., answering any questions veteran students or dependents may have concerning their educational benefits and providing resources and programs to assist veterans in navigating their transition to civilian and student life. Join the men and women of the Irvine Police Department this Saturday, May 9, 2015, for the 5th Annual Irvine Police Department Push-Ups For Charity event! Push-Ups for Charity is an annual event that raises awareness of the challenges military service members and veterans face, and raises money to support their unique needs. Push-Ups for Charity participants can collect donations from friends and family with the promise to perform as many push-ups as possible in 90 seconds. It doesn’t matter how many pushups you can do, everyone can do their part to support America’s heroes. 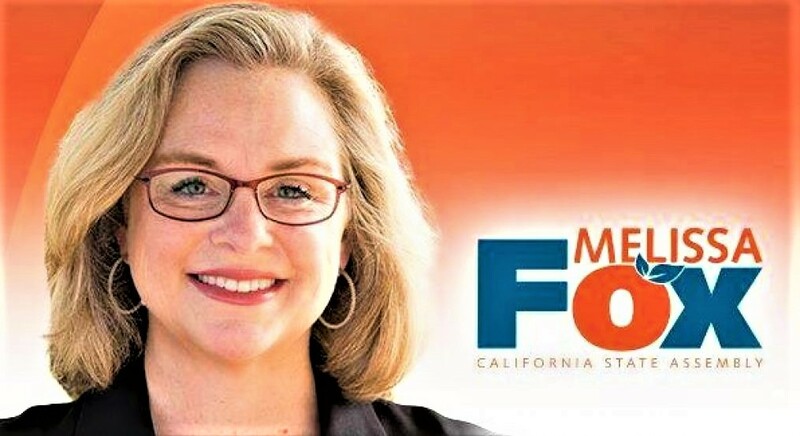 Big and small, near and far, we need YOU to get involved. Each pushup completed raises much-needed funds for the Boot Campaign, a national nonprofit that promotes patriotism, raises awareness and provides vital assistance for our nation’s heroes and their families. Come out to support the competition this Saturday at 9;00 am between SWAT teams from police departments around Orange County, members of the Orange County Fire Authority, military veterans, high school students, and many others! Anyone interested in participating but not competing can join the open session, which eliminates the pressures of competition. This fun event is open to everyone! This year, we’ll open the event at 7:30 am with the 2nd annual 5K Fun Run/Walk. This is a great $35 alternative for those who want to get involved, but are not interested in the push up challenge! Click here to register as a Host for $125 (includes training, marketing materials, and 10 official PUC 2015 t-shirts) or a Participant for $25 (includes an official PUC 2015 t-shirt. Choose your size upon checkout.). 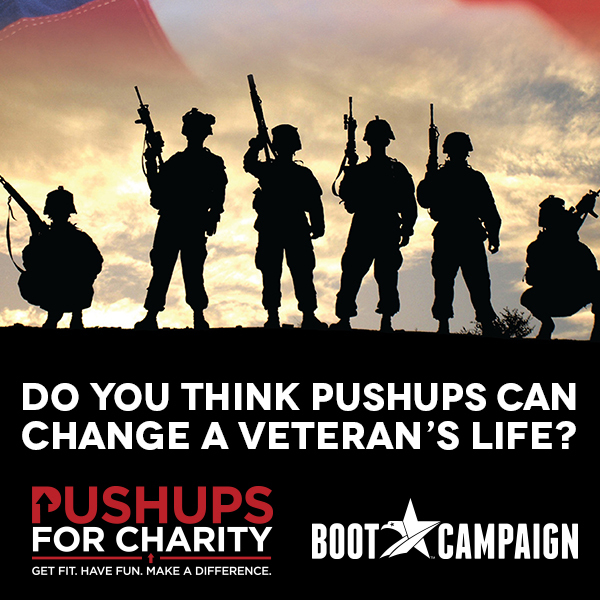 What: Push-Ups for Charity (benefits United States military veterans.and their families). Where: Irvine Civic Center Plaza, Irvine, CA 92606-5207. When: Saturday, May 9, 2015. 7:30 am for the 5K Fun Run/Walk and 9:00 am for Push-Ups for Charity. 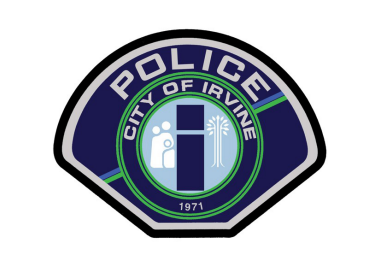 Help the Irvine Police Department make a difference in the lives of America’s veterans! Get Fit, Have Fun and Make a Difference! 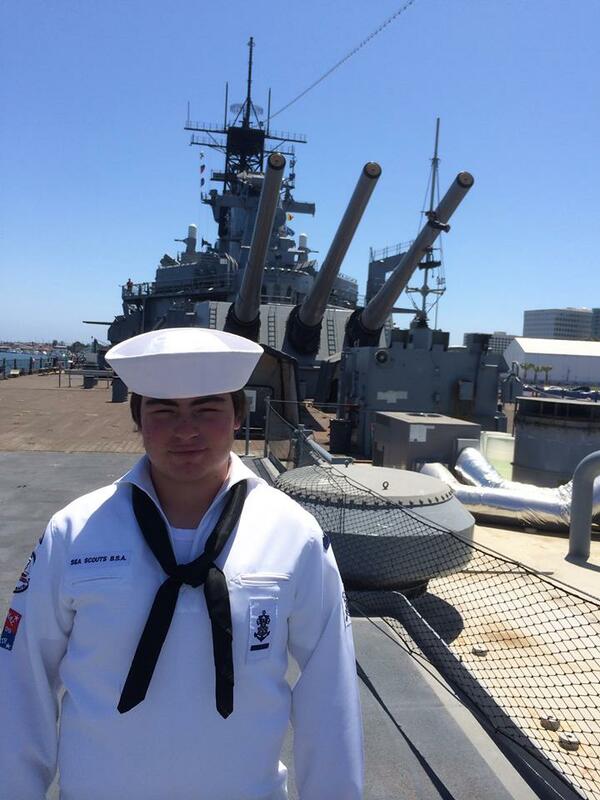 I had the pleasure this past weekend of attending the first Western Region Sea Scouts Bridge of Honor, held aboard the battleship USS Iowa in the Port of Los Angeles. 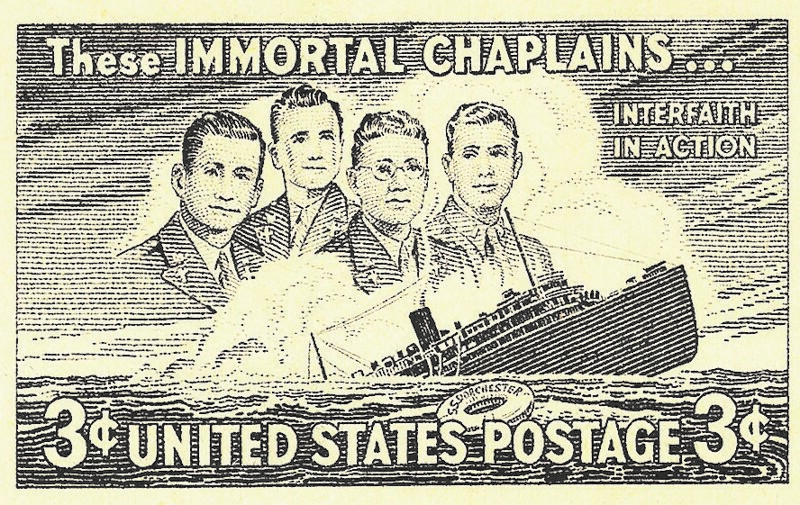 A Bridge of Honor recognizes advancement and other achievements earned by Sea Scouts – the co-ed, nautical program of the Boy Scouts of America. 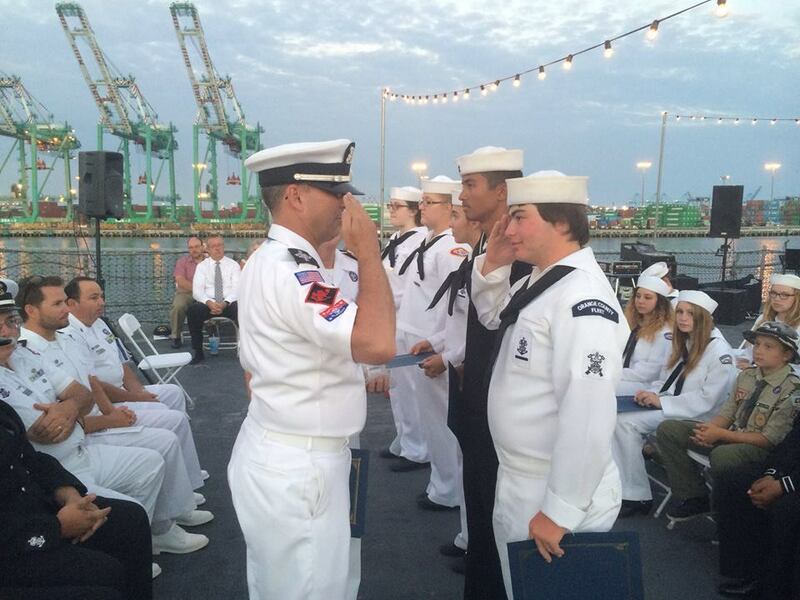 At this Bridge of Honor, several Sea Scouts were recognized for achieving the Quartermaster Award (the highest award in Sea Scouts) and many more were recognized for achieving the ranks of Apprentice, Ordinary and Able. I was in attendance because my son, Max, received his rank of Ordinary, and because my husband serves as Commodore for our area of the Western Region Sea Scouts. I also serve as a Sea Scout adult volunteer for Sea Scout Ship 90 at the Newport Sea Base. The early evening ceremony aboard the USS Iowa was breathe-taking. There could be no more majestic location than the deck of one of America’s mightiest battleships, which earned nine battle stars for World War Two service and two battle stars for Korean War service, and which carried President Franklin D. Roosevelt, Admiral D. William Leahy, General George C. Marshall, Admiral Ernest King, and General Henry “Hap” Arnold to the Tehran Conference in the midst of World War II. Along with more than 100 Sea Scouts from across the West, National Sea Scout Executive Keith Christopher was present, as was the Sea Scouts National Commodore (and retired Coast Guard Vice Admiral) Charles D. Wurster. I was tremendously proud when Admiral Wurster and Western Region Commodore Josh Gilliland congratulated Max. I was also tremendously impressed by the enthusiasm, focus, patriotism, and camaraderie of these young Sea Scouts dressed in their best dress whites and dress blues — and by their love of the sea and adventure. It was magical to watch them dancing in the twilight on the deck of the Iowa to the sounds of a live swing band. Truly an amazing evening – with the USS Iowa to remind us of the greatness of our past and these young men and women of the Sea Scouts ready, eager and able to secure the greatness of our future. May 2014 marks the 15th annual celebration of Military Appreciation Month. Yet much of the nation still has no clue about how to truly appreciate the military that makes great sacrifices to keep them safe. Sure, fellow travelers will buy a soldier, sailor, airman, Marine or Coastie a beer in an airport terminal. 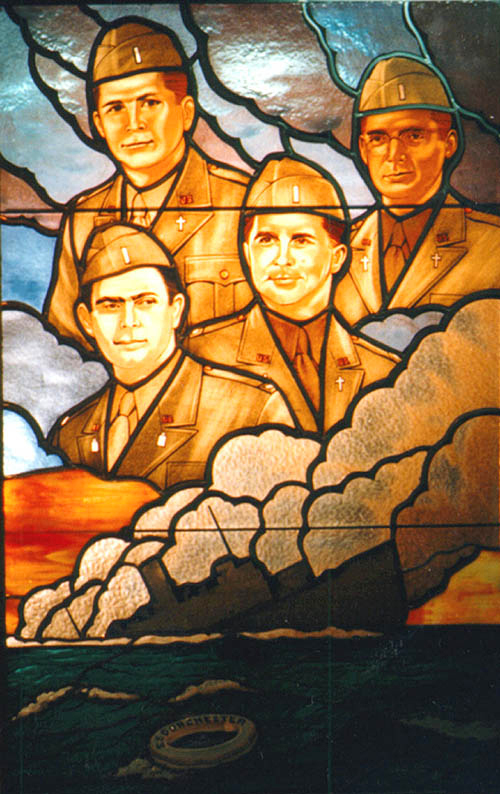 Teachers will direct students to write essays about famous military leaders. Baseball fans will cheer for a combat vet throwing out the first pitch. Such heartfelt gestures are all worthy acknowledgments. But acknowledgment is not the same as understanding — a prerequisite for true appreciation. An equally important prerequisite to appreciation is to avoid misunderstanding. Unfortunately, in a nation where less than 1 percent of the citizenry wears a military uniform and just 13 percent are veterans, there is widespread misunderstanding — and even ignorance — about what service really means. Too often, troops are seen as trained killing machines eager to engage in that singular objective, only to later return to the civilian world unskilled, uneducated, angry, damaged and dangerous. Over the past 13 years of combat, popular media — books, movies, video games and, yes, newspapers — often have fed such misperceptions, peddling combat violence as entertainment that fills the vacuum of knowledge about the truth of who serves in uniform and how that experience shapes them. ■ 26 percent of veterans age 25 and older have at least a bachelor’s degree, versus 28 percent of the total population. ■ 92 percent of veterans age 25 and older have at least a high school diploma, versus 86 percent of the total population. ■ Veterans’ median annual income is $35,367, considerably higher than the non-veteran population’s $24,521 median. ■ 70 percent of veterans voted in the 2012 presidential election, compared to about 61 percent of total eligible voters. 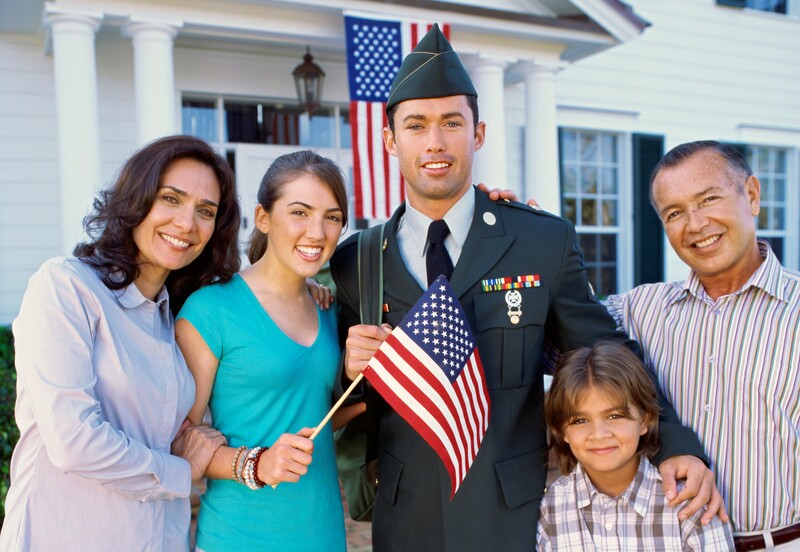 Those Census Bureau statistics show America’s veterans are educated, motivated, successful and civically engaged. So it’s no wonder the veterans’ community reacts strongly when their entire demographic is painted otherwise. One recent example of this phenomenon was an interactive map created by the online Huffington Post after the recent deadly shootings at Fort Hood, Texas. The map noted the locations where violent crimes across the U.S. had been committed by veterans — as if their veteran status, in and of itself, was the primary factor behind each and every one of those violent acts. Under withering criticism, The Huffington Post quickly took the map down and apologized, saying it essentially was intended as a plea for better mental health services for veterans. No reasonable person would argue that there are not great numbers of combat vets who need support, whether in mental health services, physical care, housing or employment — and the nation owes a particular debt to them to ensure that ample resources are provided to help address those needs. But it should not be forgotten that countless nonveteran Americans are in need of the same types of support. The greatest disservice that can be done to veterans is to lump them all into a single highly skewed stereotype. The first step to truly appreciating the service and sacrifice of America’s veterans is to understand that the vast majority served with honor while in uniform and continue to do so in civilian life, as neighbors, co-workers, spouses, parents and members of their communities.